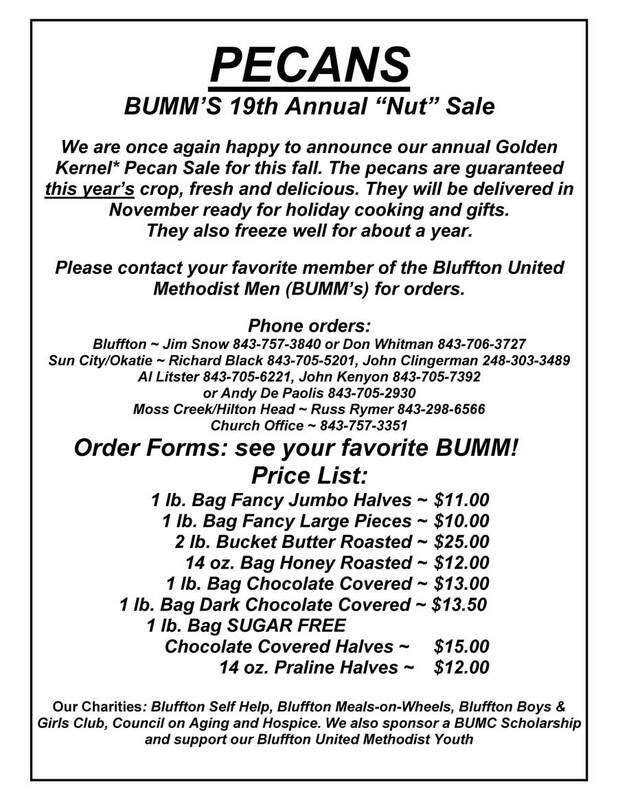 The Bluffton United Methodist Men’s clubs, affectionately called the BUMM’S, have fund raisers each year to earn money for local Charities. 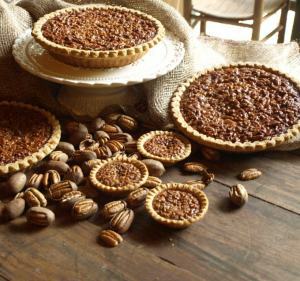 The BUMMS most popular event is the sale of several kinds and sizes of Fresh PECAN’S grown in the old south in SC, GA, AL, and Mississippi. Next, these succulent fresh nuts are shipped to the Golden Kernel Pecan Company in Camden, SC. Golden Kernel receives the nuts in their plant where they are processed including grading, sorting, splitting, coating and packaging ready for cooking, eating parties or gift giving. These delicious nuts are shipped fresh to you from the family owned, 80 year old Golden Kernel Pecan Company, right in central South Carolina. You are not only getting fresh delicious nuts but you are also employing your fellow South Carolinians and giving to local charities. Besides being grown in the US, these old south pecans (pronounced PEE-CANS) beauties are packaged naturally in succulent halves, covered with HONEY or even coated with RICH MILK CHOCOLATE or DARK CHOCOLATE! Golden Kernel Pecans are perfect for Holiday Gifts, cooking, parties or decadent snacking. Can you say PEE-CAN pie? Show your friends and relatives up north that you are truly form the south and are “NUTS” about them. Nothing says, “I love you…” like two pounds of Chocolate covered Pecans. Your orders will be available for holiday baking and gifts in mid-November. Pecans can be frozen and they will keep for about a year. The final date to order is Sunday, Nov. 5, 2018. Pecan sales support our charities: Bluffton Self Help, Bluffton Meals-on-Wheels, Bluffton Boys & Girls Club, Council on Aging, Hospice Care of the Lowcountry, , BUMC Youth and BUMM’s Scholarship. We are proud to serve and thank you for your help. Click on the flyer below to get a 2018 Pecan Order Form you can print.